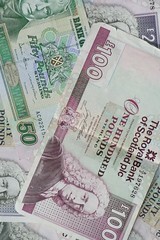 An attempt is to be made at Westminster to make it legally binding for shops and businesses in England to accept Scottish banknotes. For those who have never ventured North of the border, may be suprised to find that the Scots don’t just have their own version of our notes, but 3 different versions each issued by different banks. The reason why shops don’t accept them is that with any currency you need to know that the note is worth the paper it is written on. I’m pretty good at spotting a forged twenty. The feel, the watermark, the silver foil, the bit that rubs off etc. But I have no idea what a scottish twenty looks like, and the same goes for many staff in shops outside of Scotland. Forcing shops to accept them will just result in a large number of forged notes being passed around in the smaller shops miles away from the issuing banks. Luckly this is a Private Members Bill, so hopefully it’s not going to go far in Parliament.